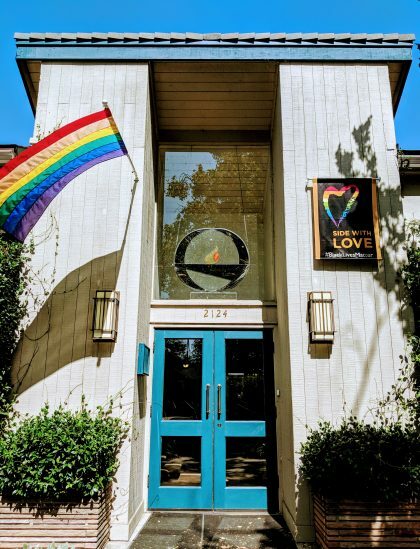 The Unitarian Universalist Fellowship of Redwood City is located at 2124 Brewster Avenue, Redwood City, CA, 94062. You can reach the office at (650) 365-6913 or at office@uufrc.org. Our building reflects our commitment to the inclusion of people of all ages, abilities, and mobilities, as well as our dedication to being a Green Sanctuary. Learn about the accessibility of our building and programs. See our Office Hours and Contact Information. During the week, we often use the entrance with the awning, on the west side of the building facing Lowell St. When events are held in the Sanctuary, we usually use the Main Entrance, which you will find facing Brewster St. Parking is available on the street in the neighborhood around our facility. Please remember to be respectful of our neighbors’ driveway space. We also have bike racks located outside our building. Please contact the Caring Committee if you need a ride, and they can help you find one. You can also ask our Connections Coordinator, Cindy Johnson, for suggestions if you would like to start a carpool.